As we noted in the Introduction, in some ancient forms of the game three dice were used, and boards of varying design. But in all the forms of backgammon that are played today around the world, two dice are used and each player moves fifteen men around the standard backgammon board. In all forms the object is to bring them into the home board and then bear them off. However, in some forms of the game there are no blots at all; one man may control the point he is on instead of two, and six single men in a row then form a prime. Doubles are usually played four times, but in a few versions doubles warrant extra plays. And though usually if a man can’t play his whole roll he loses the rest of his moves, in some forms of the game his opponent can then play the unused moves. In several versions the men are not arranged around the board at the start of the game; either they all begin off the board or all on one point. We couldn’t possibly cover all the forms of the game played today, but we can discuss, briefly, a few of the more interesting ones. We’ll begin with a couple of beginners’ games. In the Middle East children are taught to play backgammon by first learning this simple game. Each player puts three men each on his one, two, and three points, and two men each on his four, five, and six points. As usual, to begin, each player throws one die, and whoever throws the higher roll plays first. After a player rolls his dice, he takes off a man on each point corresponding to the number thrown. The first to bear off all fifteen men wins the game. There is only an infinitesimal amount of skill involved, and the man who gets first play is usually the winner. This simple game is our own invention. 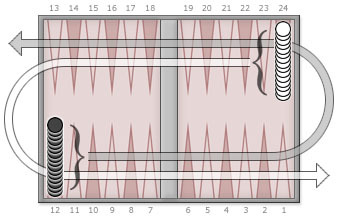 The setup is the same as for backgammon except that each player’s two back men (formerly on the opponent’s one point) have been brought forward to join the five men on the opponent’s twelve point. Play proceeds as in regular backgammon, but no blots can ever be hit; it is just a question of which player rolls the higher dice. There is a little skill involved in learning how to use your rolls to best advantage. Moreover, if played with the doubling cube you can learn when to double or not to double in running games. In other words, beginners can have some fun and learn something. In addition to regular backgammon, Turks play a variation called moultezim, quite different in character, beginning with the board and setup of men. In moultezim white’s one point (and inner board) is at the lower right, as in regular backgammon, but black’s one point (and inner board) is at the upper left instead of the upper right; black’s twelve point (and outer board) is at the upper right, where his one point and inner board are in regular backgammon. In the setup, all fifteen of white’s men start on black’s twelve point (the old black one point and black’s fifteen men start on white’s twelve point (also the white twelve point in the regular game). Black must move all of his men the full twenty-four points around the board: first to the right from white’s twelve point in the white outer board, into white’s inner board, then into the black outer board (his inner board in the conventional game, remember), then to his own (new) inner board, and off to the left (instead of the right as in regular backgammon). White also moves in a counter clockwise direction: from the black twelve point in black’s outer board into the black inner board, then into the white outer board and into the white inner board and off to the right, the same as in the regular game. The primary strategy is to create a prime, in order to block your opponent’s progress into his home boards; following that, you run and bear off your men. Men are not hit or sent home; there are no blots. A single man controls the point he is on in the same way as two men control it in backgammon, and his opponent then cannot stop on that point. You are not allowed to occupy more than four points in your outer board. This means that you are not allowed to establish a prime right in front of your opponent’s starting point on your twelve point. To begin the game, each player rolls one die. The high man then rolls both dice for his first play. You must move one man into your own outer or inner board before you can move a second man from the starting point. In other words, you must get your first man past your opponent’s men on your twelve point before moving any others. This fourth rule may not seem important, but just see what happens to you if your first four rolls should happen to be double 6, double 6, double 3, and double 1. Since black occupies your twelve point, you can move only one 6 with the first roll, and you can’t move at all on the second roll. On your third turn to play you can move that forward man three more spaces, and on your fourth turn you can play two of the four aces. By this time your opponent will have moved one man across the dividing line past your other men piled up, and he will have placed a couple of other men in your outer board; suppose they occupy your nine and ten points. Now you roll 4-1 and once more can’t play. Two plays later he will have completed a prime in your outer board against that man of yours, and you won’t be able to play at all until he breaks his prime. Now he will proceed to move his other nine men around the board, and barring accidents he will use six of them to form a second prime stretching from his ten point to his five point (remember that he must leave the eleven point open: Rule 2). Then he will break his prime in your outer board, and at last after you have been able to move that one man into your own board, you will be able to move one of your other fourteen men still on his twelve point — but only if you roll an ace. Of course, most of the time in moultezim each player will get his first man around into his outer board in two or three turns and will then be able to move other men. At this stage of play you should try to occupy one or two more points in your outer board and as many points as possible in your opponent’s outer board (right in front of your starting point). It is almost always very poor tactics to move any of your men into your inner board in the early play. If you can establish a prime anywhere in your own board, you should win the game. Establishing a prime in your opponent’s board is by no means as valuable, since his men blocked by your prime will be far closer to home than your men in your prime will be, thus giving you little advantage in the running game once you break the prime. Even if you can’t make a prime, remember that each point you occupy in either board belongs to you, and the advantage in moultezim — as in all forms of backgammon — goes to the man who holds the greater number of points. This game is played in the American Navy. It is close enough to some Mediterranean variations of backgammon to suggest that it was picked up there. In this game all the men start off the board. They enter and move around the board in the same way as men sent home in regular backgammon. In other words, the white men enter in black’s home board and move around through black’s outer board and white’s outer board until all are gathered in white’s home board; then white can start to bear them off. Black enters his men in the white home board and moves around in the same manner. Rules are the same as for backgammon, except that you can move any man you want to at any time, whether or not you may have men to bring in. In addition, the roll of 1-2 — acey-deucy — is an especially valuable roll. You begin by playing your ace-deuce. They you play any number four times (in other words, you pick any double you wish. Then you get an extra roll. And if this extra roll is also 1-2 you get the same extra with it. Early game strategy in acey-deucy is to try to establish advanced points as quickly as you can, and if possible also establish adjacent points as base for a prime. If both sides develop primes right smack up against one another, the advantage lies with the prime that is farther advanced. Even if the man with the farther-advanced prime has to break his first, he will probably win the game; if he can hold his prime longer, he almost surely will win. There is one bit of unusual strategy in acey-deucy that we consider rather sharp practice*. A player who is getting the worst of the game will bring only fourteen men into play, holding the fifteenth (known as “Clammy”) in his hand. Eventually his opponent will have to expose a man or men while bearing off. “Clammy” will hit one of these blots and the whole complexion of the game will change. It is sharp practice, but Navy men are supposed to be able to count to fifteen. * Sharp practice: a pejorative phrase used to describe sneaky or cunning behavior that is technically within the rules but borders on being unethical. A number of varieties of backgammon are popular in Greece. Regular backgammon is called portas , or “doors”; each point is one porta (and a prime of six points would be “all doors closed,” we have a hunch). Another version of the game played in Greece is usually called plakoto. 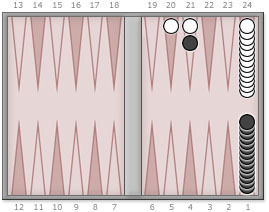 The inner and outer boards are the same as in regular backgammon, but all fifteen of white’s men are on the black one point, and all of black’s men are on the white one point opposite (i.e., both to the right, if you are sitting in white’s chair, and to the left if you’re sitting in black’s, opposite). All the men must again move the full twenty-four points, in the same direction as they do in regular backgammon. In plakoto you can stop on an opponent’s man, but you can’t take him off the board. However, as long as you leave your man on him, he cannot move. The advantage you gain by pinning a man is far greater than you gain by hitting a blot in backgammon. When you hit a blot, that man can be brought into play again. When you pin a man he is out of play until you remove the pin. Furthermore, you have full control off the point in question and can move additional men to it. As an example of the value of an early pin, suppose that you roll 4-3 as the opening play of the game. Your correct play is to move two men forward to the black four and five points, since you want to start making as many points as possible quickly. Black proceeds to roll double 5. He uses all four 5s to move one man to pin your blot on his four point. If the game were played using the doubling cube, he would have a doubling advantage irrespective of your next roll; as it is, he is at least a two-to-one favorite to win the game and a gammon is quite likely. Except for the initial setup and the pinning of blots, all rules are the same as in backgammon. Your strategy is to establish as many points as possible as quickly as you can, unless you get a chance to pin a man or men. This game probably originated in Turkey, but it is played throughout the Middle East. The men are set up and moved as in plakoto, but there are no blots and one man stopping anywhere controls the point he is on, as in moultezim. The distinctive feature of this game is the rolling of doubles. When a player rolls a doublet, he plays that number four times; then he plays the next higher doublet in the same fashion, and so on until he has played double 6. Thus a throw of double 1 entitles the lucky player to play four aces, then four 2s, then four 3s, then four 4s, then four 5s, and finally four 6s. Obviously if you get a chance to play such consecutive doubles early in the game it is most advantageous, but in the middle game when your opponent controls a lot of points (remember one man is enough for control) the chances are the you won’t be able to complete your move. If so, you forfeit what you can’t play to your opponent. Thus, if you roll double 2 and after playing four 2s and a 3 find that you can’t play a second 3, you lose the rest of your move; but instead of just losing it as in backgammon you lose it to your opponent who now proceeds to play the other 3s, the 4s, 5s, and 6s. If he can’t complete the play, the rest of the moves are not made and he takes his next roll. Planning strategy in this game consists mostly of preparing a position in which you will be able to move doubles (principally 5s and 6s) while blocking your opponent from doing the same. In this case it won’t matter which one of you throws a double. You will get all the play if you roll it and most of the play if he does. With all this complicated planning the game is likely to be far slower than other forms of backgammon. We have included these other games in case you should ever get tired of regular backgammon and want to try a substitute. Our own experience is that there is so much variety to the regular game that we never tire of it.